Given that we now live in a technodemocracy, where everyone with an iPhone and a laptop can try their hand at various esoteric art forms that used to require years of schooling, and hundreds of thousands of dollars worth of equipment, we now have a rather interesting dynamic of possibilities. Like the monkeys with the typewriter, when everyone has access to these tools and "has a go at it" the result is that there is an ocean of produced art, more songs than you could ever listen to in a lifetime, more photography than could ever be reasonably flashed by your retinas, videos on youtube that played end to end could take us to the next millennium. So do the monkeys actually ever tap out the Shakespeare? Yes sometimes. Justin Bieber's youtube performance on the steps of a storefront in Stratford Ontario led to superstardom and your author is surely as guilty - trying my hand at architectural photography with a Costco Nikon and a handful of lenses. We and the environment are reasonably safe however because in the realm of digital media, the results can be easily clicked on and dragged to the trash. Not so with architecture and the built form. I've seen more than a horrifying amount of houses that were conceived by builders and other well meaning individuals who thought to themselves "I want to design my own house." If you catch yourself muttering this phrase, please consider getting skilled help! Architecture is not about assembling rooms, and picking out flooring and countertops. Architecture incorporates a vast array of disciplines including fine art, with its classical study of naturally appealing ratios, spatial relationships, colour and mastery of light and shadows. Also required is a deep study of human ergonomics and life patterns, primal instinctual nesting inclinations, and personal client wishes. Throw in some intricate structural engineering, and site specific study of climate, wind, topography et cetera and you can quickly see how vast the task at hand really is. It's definitely not something to be entrusted to someone who spent a weekend thumbing through "Architecture for Dummies." 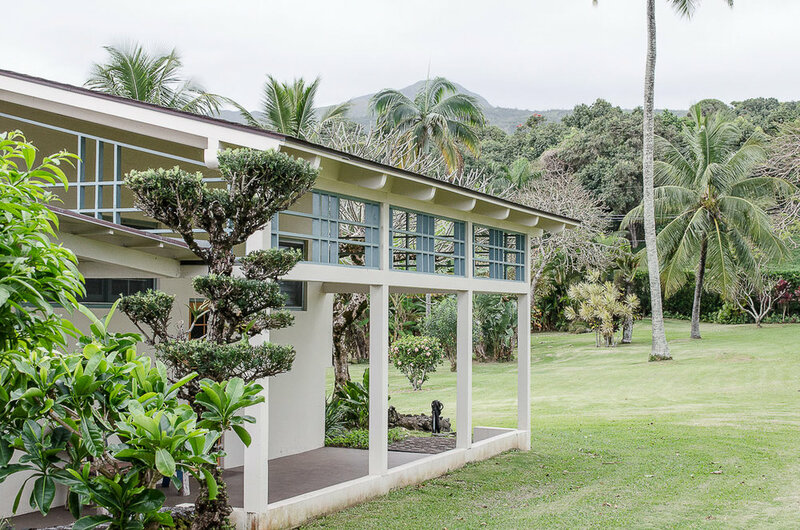 Although we have no historical proof, it is believed that this house was designed by Albert Ely Ives who also is responsible for designing the Hotel Hana Maui. 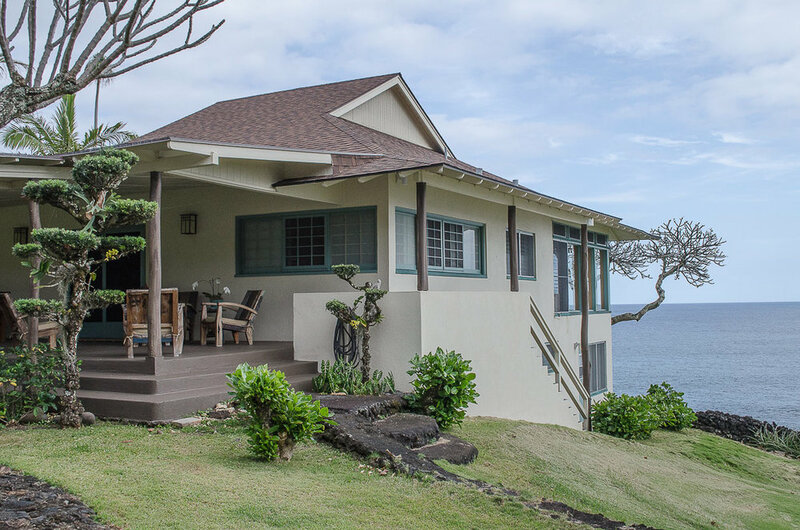 Here at the Gale's house in Hana, we see perfection in scale. Scale both from a human ergonomic point of view, as well as a broader cultural point of view. 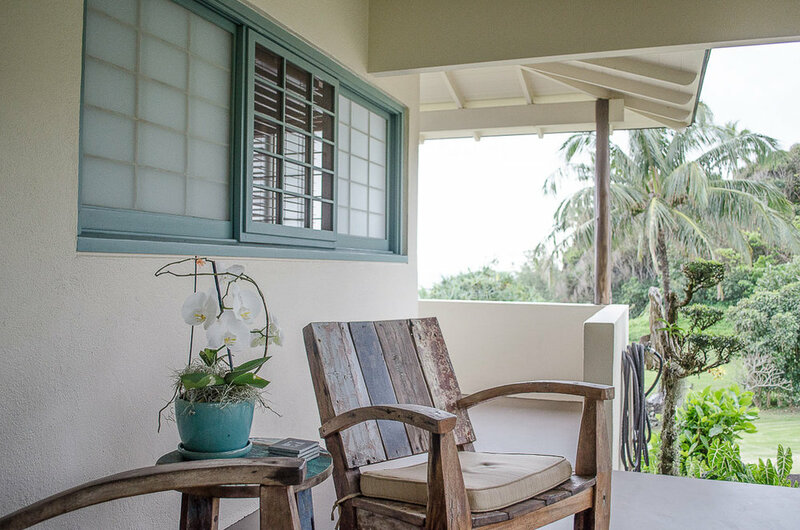 Hana is a quiet sleepy town that does not tolerate extravagance, nor opulence well. 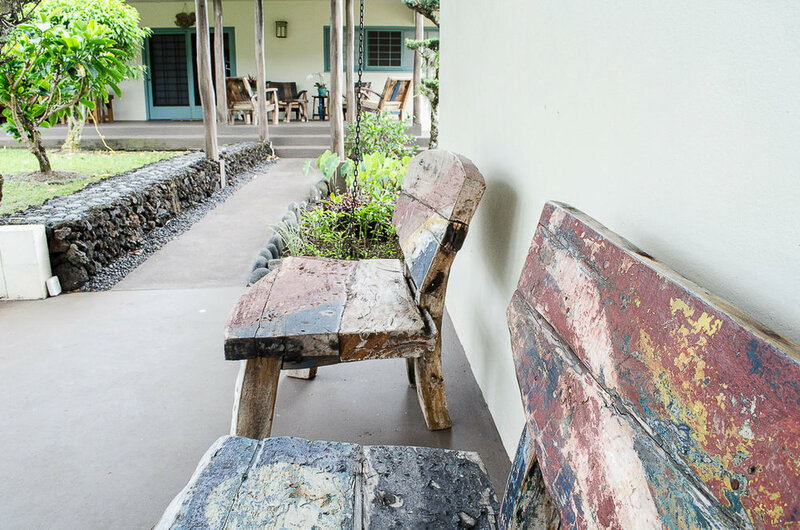 The property is organized as an intimate hillside village comprising the main 1 bedroom house, connected to three other living spaces - "quarters" each with their own level change, and unique garden path. 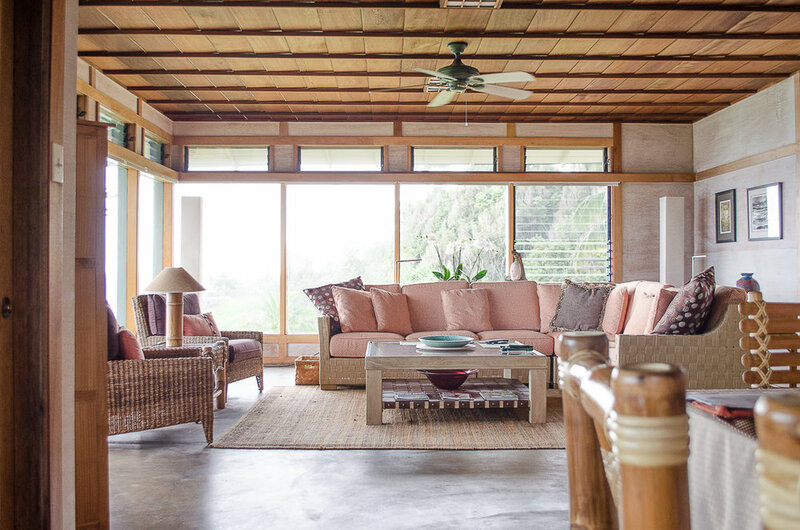 The studio, pulled back and Kaupo side of the main house has its own lanai ordered toward a craggy tree and frames the ocean smashing on distant rocks. 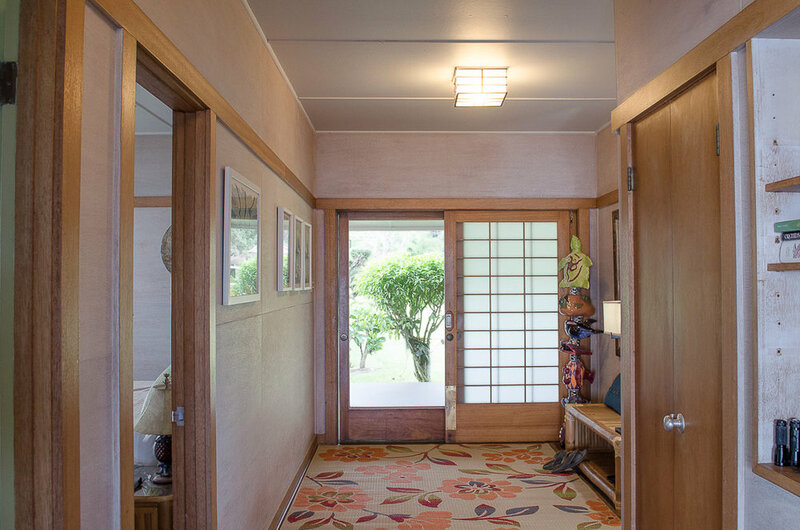 Its entryway lattice work echoes the delicate detail of the main house's horizontal windows. Gorgeous! 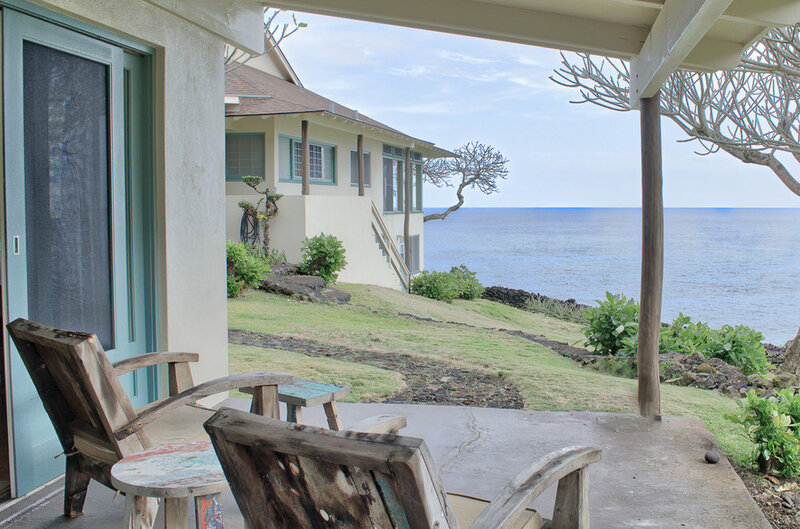 The cottage, Hana side and separated by a faerie garden fountain and an outdoor shower kiosk is a mini incarnation of the main house with its bedroom thrust toward the ocean. The stairs in the first picture above, lead down to what I'll call the writer's room - the most collected and private space on the property. 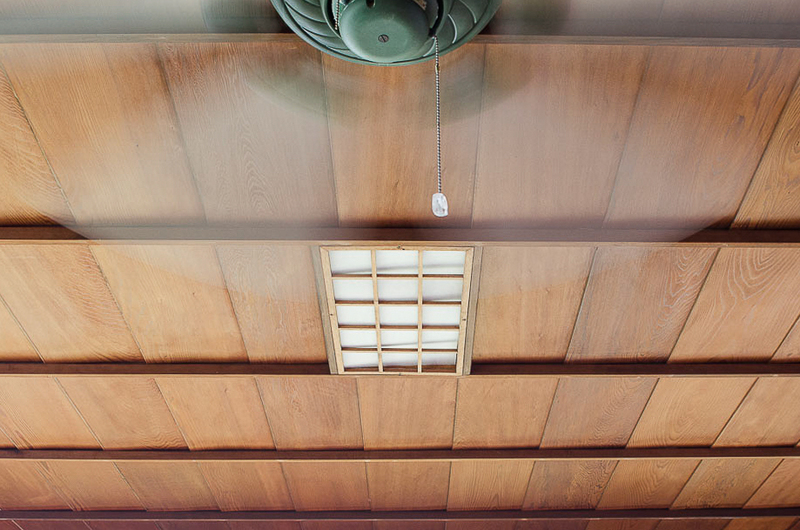 As you cruise through the photos above, you'll see that the scale of each room invites human interaction, comfort, and peace. 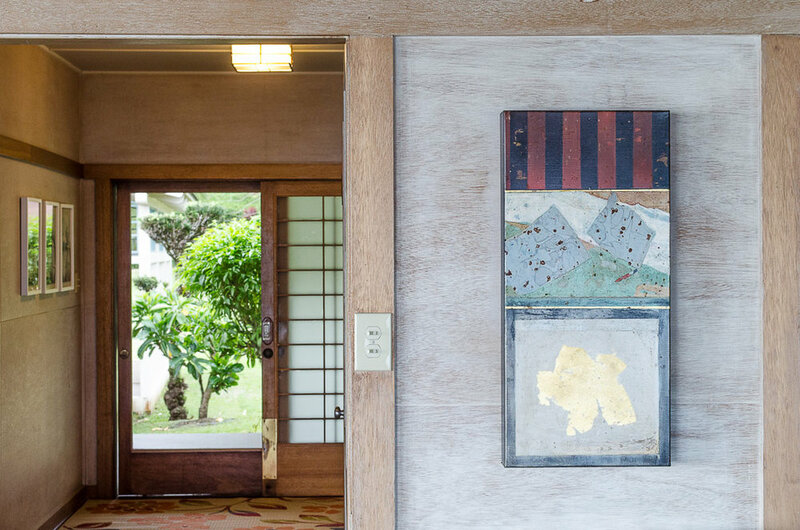 While it may appear that the property is 3 separate structures (plus a fourth garden/garage villa), the property works as a large garden dwelling where the hallways are actually outdoor throughways punctuated by topiary, bonsai, and native kalo plants as well as cheery tropical flowers. While at first, one may question the idea of a 1 bedroom house, what's accomplished here is far superior to any 4 bedroom house I've ever seen. Nowhere perhaps is the choice of materials more crucial than for a construction project beside the Ocean. 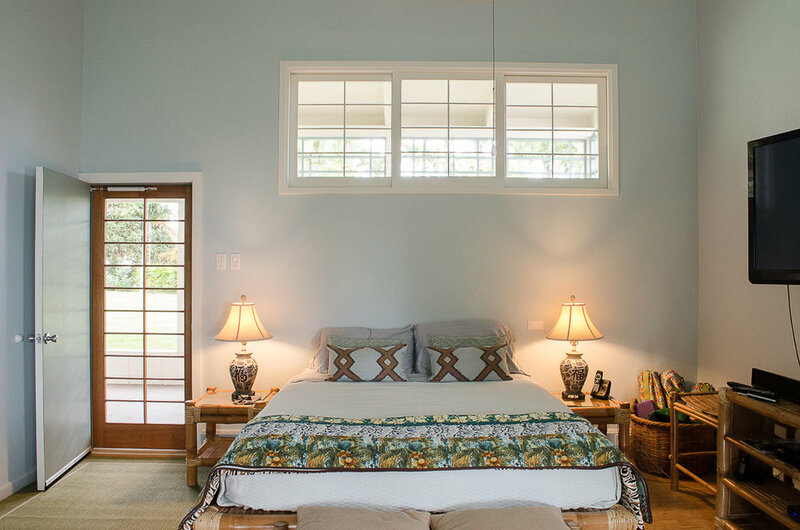 The onslaught of salt breeze, wind, and sound creates an interesting trio of conditions that all can be addressed well by appropriate material choices. 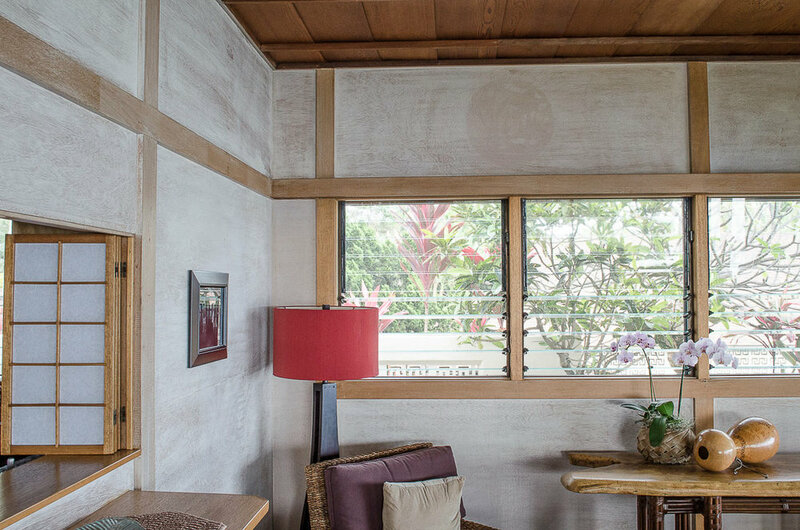 This house is built mostly of concrete but the concrete is so well hidden in the softness of its wood walls and decorative windows. 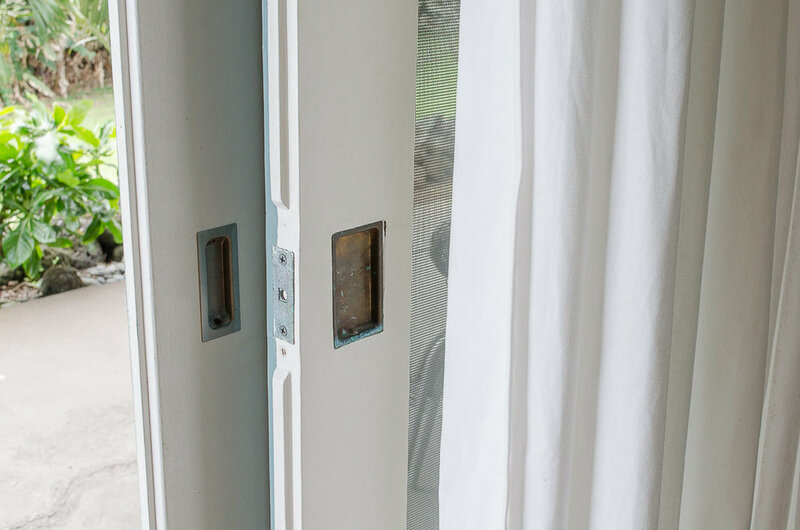 Metals are minimized on the exterior and where possible hardware is non ferrous in nature. (Brass, copper, etc).